Even though it was so insanely hot on our last visit to Thailand in March, there was a huge benefit to going during the most intense part of Thai summer—we were in golden, sweet, sticky heaven since succulent Thai mangos were in season. One night we had our friends over to the condo where we were staying in Bangkok and asked them to bring a dish from the street to share. Two people brought the same dish: mango sticky rice! We had so much that we feasted and feasted and feasted. And I still wanted more. We even got a mango sticky rice sundae at Swensen’s, a fancy ice-cream parlor seen mainly in the malls in Thailand. It was a massive bowl full of mango ice cream, sticky rice, mango and whip cream. We split it between five people and still had gobs of ice cream melting in the massive bowl when we were all filled to the top. In honor of my pregnancy fruit cravings, I decided even though the mangos at HEB aren’t going to taste as smooth and silky and sweet as those in Thailand, I just had to make Thai mango sticky rice. Since I don’t have a handy-dandy Thai sticky rice steamer, the trickiest part for me is figuring out how to make the sticky rice. But then I read this awesome post on how to make sticky rice without a steamer, and have used that method ever since with great results. I use a saute pan, splatter guard, and put another pan on top and it works for me! 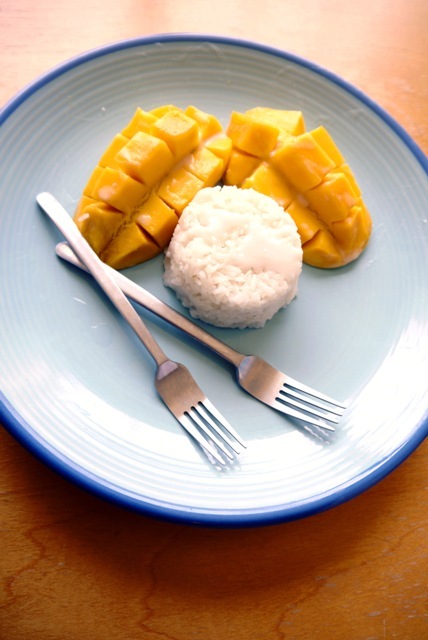 Since cute Mexican Ataulfo mangos are in season now, make the most of it and make mango sticky rice tonight!! 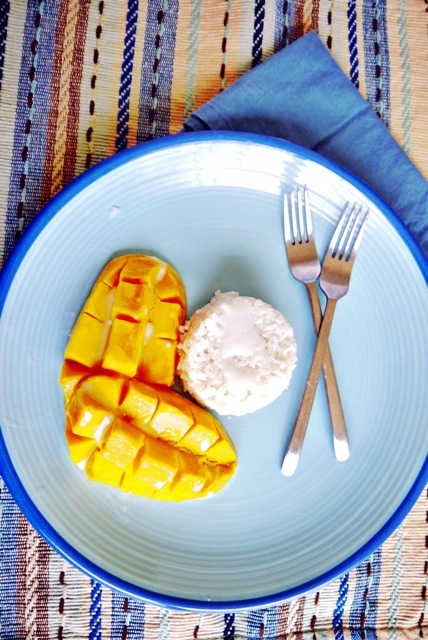 Use this recipe to make your favorite Thai dessert, homemade Thai Mango Sticky Rice! Soak your rice for at least two hours and up to five hours. If you forget about it and soak it too long like for a day or more, it ferments and gets gross, lesson learned! Steam your rice using your preferred method, whether it's a Thai Sticky Rice Steamer or using the splatter guard method like I do. If you try that method, fill a saute pan, or pot with water until it's about three inches below the top of the pot. Bring it to a boil. Then place the splatter guard on top of the pot and spread out the rice in a thin layer. 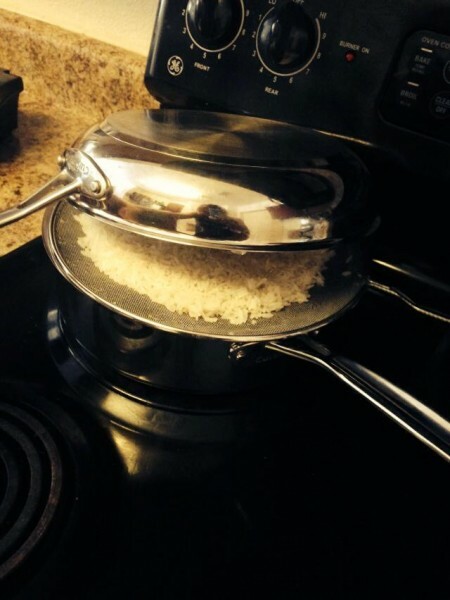 Place another pot or bowl on top of the splatter guard so it covers the rice, but doesn't touch it. Let the rice cook for about 20 minutes or so, until it's sticking together and cooked through. I like to taste it to see if it's reached the soft, sticky texture. While the rice is cooking, start on the coconut sauce you will mix into the rice. Place the coconut milk, sugar and salt in a small pot, and bring to a boil, stirring until the sugar is dissolved. Once the rice is cooked, place it in a bowl or dish of your choice. Pour some of the coconut sauce into your sticky rice and stir until it's well mixed. You wont use all the sauce, save about 1/2 cup of it or so to pour on top of each serving. Put a cloth over the top of the rice, and let it rest for about 30 minutes to let the rice absorb the coconut sauce. 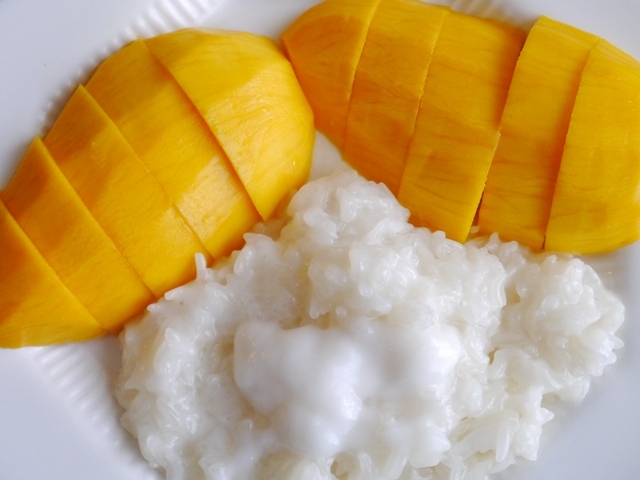 Place the sticky rice, and mango on a plate and add the leftover coconut sauce to your heart's delight. The only rice you can use to make Thai sticky rice is called Thai sweet rice or glutinous rice. If you use normal rice it wont be sticky. I like the sauce I stir into the rice to not be as sweet since I put the sweet coconut topping on it. But feel free to make it sweeter if you prefer that!